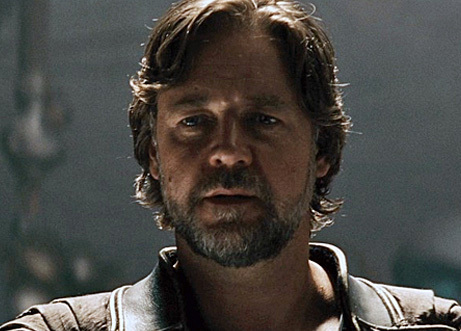 LIKE FATHER LIKE SON: Is Jor-El Alive in ‘Man of Steel’? It’s a question that’s been surfacing on the Internet for months now: Is Krypton, and more specifically, Jor-El, alive and well in Man of Steel? We know that David S. Goyer revised Superman’s backstory, but we as fans presumed the crux of Superman’s origin would remain the same; namely, that a scientist sends his son to Earth in a rocket ship before his home planet is destroyed. But recently, people have begun to wonder whether or not Krypton is actually still floating around safely in space while Superman grows up here on Earth. Did Jor-El send his son here to avoid death? We know that part of Superman’s new backstory shows that his natural birth is actually illegal on Krypton, so this could be true. It could also be that Jor-El wants to save his son from a civil war that may have broken out on the planet, something that would explain the opening of the newest trailer. Whether or not this is actually true remains to be seen, but if you watch one of the new TV spots, it may lead you to believe that Jor-El is in fact alive throughout the film. Take a look at the top image, taken from the new trailer. It’s a show of Jor-El (Russell Crowe) watching a battle unfold on Krypton. The image right below that is a scene in one of the new TV spots, showing Henry Cavill’s Superman floating in space with a figure looking on. It’s not a clear picture, but there is no denying there is a resemblance between the figure in the TV spot and Russell Crowe’s Jor-El in the trailer. So, what do you think? Wow, you clearly have not read Superman Birthright, this is a transmission from Krypton the moment the planet is destroyed. Since there is huge time space difference between both planets due to Kal-el entering a worm hole Jor-el was speaking to Superman only minutes after he sent his son off in a shuttle to earth. read the last page of Birthright.. There's a scene in one of the tv spots too where lois is firing a krytonian looking weapon while standing behind jor-el inside the fortress! And inside the fortress there's pods with bodies inside and one of them is open, according to deb snyder! Now yea it could be just a transmission recorded by jor-el that is a live interactive feed thst responds to kals questions, like in birthright and the donner movies OR that open pod belongs to jor-el because the fortress is actually a ship that housed a handful of krytonians in cryogenic sleep from krypton to earth right before it's destruction and those krytonians are hiding out in that fortress until they can find a replacement home pkanet! But only time will tell i guess!